Before I begin, a short preface. I have made it something of a personal mission, both as a researcher and writer on historical simulation games and as a classroom teacher, I love to do research on the best www.easyslots.com games, to crack the Civilization IV code. In other words, to find ways to make its educational value commensurate with the significant amount of time and effort it takes for my students to learn to play and become really familiar with the game. Over the years I have made progress here and there building on what I have learned in each implementation. This coming year, I plan to take a big step forward in using Civ in my 9th grade ancient world history class. In the hopes that my process of reasoning, planning, and implementing may prove useful, or at least interesting. I am going to “work out loud”, so to speak, posting blog entries of the work I’m doing reconceptualizing the use of Civ 4 in my classroom. It may well be that some readers will find me to be stating what is obvious to them or confirming ideas and practices they have already adopted in their own classes. I am hopeful, though, that enough readers will find something of interest. Don’t hesitate to let me know whether you find this useful or mundane. For some time now I have been struck by the parallels between the world systems that Civilization IV presents and the world systems of agrarian civilizations presented by Big Historian David Christian in his excellent, Maps of Time. And it occurs to me that, so long as one believes comparative work and big-picture trends are important components of an ancient world history course, Civilization IV might well be an outstanding tool for examining those trends. 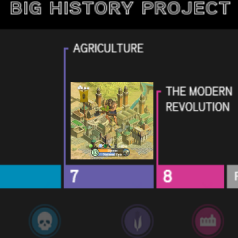 So that’s what I’m going to do with Civilization IV in my next course in Ancient World History, use it explicitly to illustrate the core features of agrarian societies and the major trends in ancient world history. I have certainly done bits of this in the past, like using Civ to illustrate Diamond’s Guns, Germs, and Steel hypothesis, but I have never systematically approached the year-long play and investigation of Civ in this way. Agrarian communities that provide most resources. These are largely separate from elite groups but they contain most of the population and produce most of society’s people, food, energy and raw materials. Networks of exchange through which states and cities procure resources that cannot be secured through naked force. Though these are not the only common features of agrarian civilizations, I absolutely agree with Christian that these are important features, useful concepts for studying agrarian societies. The next step is to consider the extent to which Civilization IV’s systems model these structures. For if the game does a good job modeling at least some of these features, it can potentially provide a useful tool to help students meaningfully learn about these features. What follows is a first rough pass considering whether and to what extent Civ IV does model these features of agrarian societies. Please note, I am not suggesting that Civ must be interpreted these ways, only that it arguably can be. I welcome additions/subtractions/corrections. Gender hierarchies: (yes) Though the rationales for patriarchal society are not really illustrated in the game, Civilization IV establishes a gender hierarchy early and often. With the exception of some women rulers, women are largely absent from the game. Worker units and military units are depicted as males. The specialists in a city are also depicted as males. From the player’s perspective, women are almost invisible. Cities and towns: (yes) If Civilization is about anything, it’s about cities. Urban centers are the sources of production and learning and if the player loses all her urban centers, she loses the game. A complex division of labor: (so-so) It’s there if one looks for it. Each city has the potential to move a population unit from harvesting resources in a square to serving as one of the following specialized members of the community; engineer, merchant, scientist, artist, priest, or citizen. A presence of specialized labor may be inferred from all the buildings one can construct in a city, which would need to be staffed by specialized personnel. If one assumes that the population in a Civ city largely lives out in the countryside, there is a clear division of labor between the tribute-taking, educating, producing city and the raw-material-supplying countryside. Hierarchies: (no) Civ IV really does not do this in the sense meant by Christian. Historically urban centers would have local ruling elites who in turn answered to elites at the regional level who answered to the capital level. And while Civ civilizations are divided up into largely autonomous cities, it would be a stretch to say those cities are controlled by anything other than the god-king player. Armies: (mostly yes) When rival civilizations are in a militarily dominant position they generally attempt to extract technologies, money, or resources, so to this extent armies serve as a protective and a coercive force. Their role coercing members of their own society is essentially missing with two exceptions: if a civilization has the hereditary rule civic, each military unit decreases unrest in the city, and with the nationalism civic, barracks increase happiness by 2. Perhaps these are to be understood as the effects of coercion? Literate bureaucracies: (no) In Civilization the need for bureaucracies is replaced by the game itself, which calculates, collates, and presents the necessary information of resources. Networks of exchange: (yes) Several trade networks are built into the game. Consider that technology, luxury resources, strategic resources, and money can be traded with other civilizations that in turn can trade with other civilizations. Also consider that a trade network exists, or has the potential to exist within each Civilization. If the necessary transportation/communication structures exists—roads, rivers, ocean shores (once sailing is discovered)—cities and resources will be connected to the capital and one another through a trade network. This allows each city to benefit from luxuries (which generally increase an urban population’s happiness and sometimes health)and strategic resources. Finally, trade networks that generate commerce income are formed between cities within one’s civilization and outside of one’s civilization. Systems of religion and ideology: (so-so) There are systems of religion and ideology in the game. The former is modeled by the seven religions in the game: Buddhism, Hinduism, Judaism, Taoism, Confucianism, Christianity, and Islam. How well they are modeled is a rich topic for debate since the game designers purposefully gave each religion exactly the same benefits and characteristics. Each does give access to different types of monumental architecture. Civ’s civics system allows players to choose ideologies/philosophies in five categories: government, legal, labor economy, religion. Each ideology has a different impact on gameplay, though not really in the sense of inspiring art and architecture. The piece about ideological/religious systems sponsored by and legitimating the state, however, is not really illustrated by Civ. Wider hinterlands: (yes) Absolutely. Control of luxury resources and strategic resources is critical to the strength and success of a civilization and these resources, when they are not in the exploitable hinterland of a city (which I am interpreting as under direct control), must be connected through trade networks. The next step for me is to look at the long term processes in effect from the period c. 3000 BCE – c. 300 CE and see which of these processes, if any, Civilization illustrates. I’ll let you know what I find when I get there.